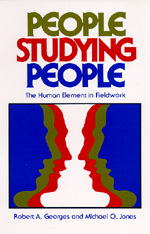 The authors of this book demonstrate that fieldwork is first and foremost a human pursuit. They draw upon published and unpublished accounts of fieldworkers' personal experiences to develop the thesis that an appreciation of fieldwork as a unique mode of inquiry depends upon an understanding of the role the human element plays in it. They analyze the processes involved when people study people firsthand, focusing upon the recurrent human problems that arise and must be solved. The human processes and problems, they argue, are common to all fieldwork, regardless of the disciplinary backgrounds or the specific interests of individual researchers.